The Mother Ditch is flowing this spring and it is beautiful sight. We have been doing a little work along Acequia Madre and Canyon Road, and I find myself lingering on those jobs just to watch water go downhill. Having been born on Garcia Street within a few hundred yards of the ditch, and then spending five years or so in Agua Fria Village within a few hundred yards of where the ditch empties into the Santa Fe River, I am attracted to the workings of this relict watercourse. It is nearly thirty years since I offered my services to the then mayordomo, Ignacio Moya. I believe it was 1977 or 1978, and the ditch had not run for several years because of the increasing impoundment of water in the reservoirs. There were areas that hadn't been cleared of debris during that entire time and I understood from some eastsiders that ditch rights were in danger of being forfeited for lack of use. Mr. Moya was forcing the issue to have the ditch cleaned and the gates opened to let the water flow. I called him and volunteered my entire crew with a backhoe from Crocker Drilling for a Friday, and myself on Saturday, to clean out some especially troublesome sections of the ditch. 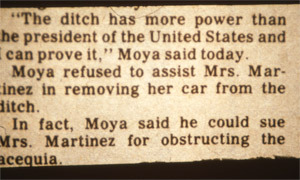 Really, one of the fondest memories of my life is standing on the corner of Cerrillos and Paseo, where Statements is now, and listening to Mr. Moya say, "You have to dig it up. They have no right to cover it. You dig it up." He was talking about a paved parking lot full of new Hondas belonging to Julian Garcia's automobile dealership. Naturally, I resisted. I told Mr. Moya that I couldn't simply tear up asphalt in the middle of someone's business. "Oh yes you can," he told me, "I authorize you. The ditch has more rights than the President of the United States. No one can prevent the water from running. You dig it up!" Naturally, in the presence of someone with that kind of pizzazz, authority be damned. I just dug. That was early Saturday evening. 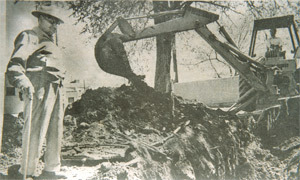 The front page of the New Mexican on Sunday morning ran a picture of me on the backhoe digging up Julian's parking lot. The rest of the story is that during the night some poor lady pulled into the lot and therefore into the newly opened and flowing acequia. Fortunately, she was okay and the car only sort of damaged. Lawsuits predictably ensued. There is a restraining order issued by Judge Harl Byrd (who slightly later performed one of my serial wedding ceremonies) that prevents me from entering those premises ever again. Other than that, Mr. Moya proved that the rights of the ditch prevail. And so the water flows and the adventure continues. We have been called to look at three flooded basements in adobe houses along Acequia Madre. After much head scratching and some false accusations being leveled at the City over an assumed broken water main, we have determined that in all likelihood the Mother Ditch is in trouble again. We have solutions for the basements, but for those of you with moisture problems along the sacred route of the ditch, don't even think of trying to get the City to shut it down (it can't) and don't ask the mayordomo for compensation. He has no time for that kind of nonsense. He has more rights than the President of the United States. Thank God someone does.